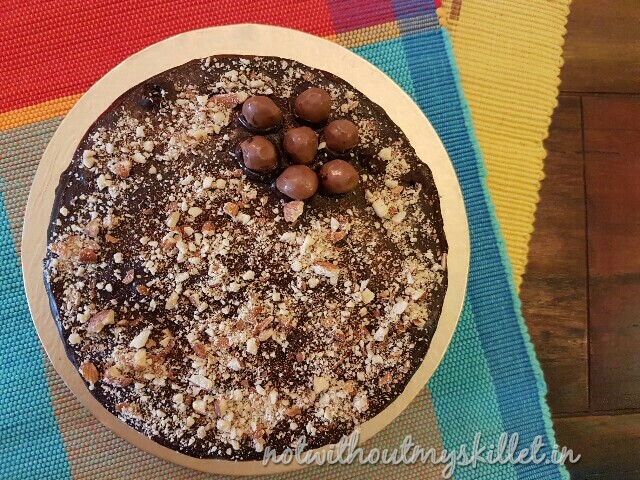 When I did look up the blog, I realised I had 7 different chocolate cake recipes on my blog…but for chocolate that’s not enough. I love experimenting with chocolates. 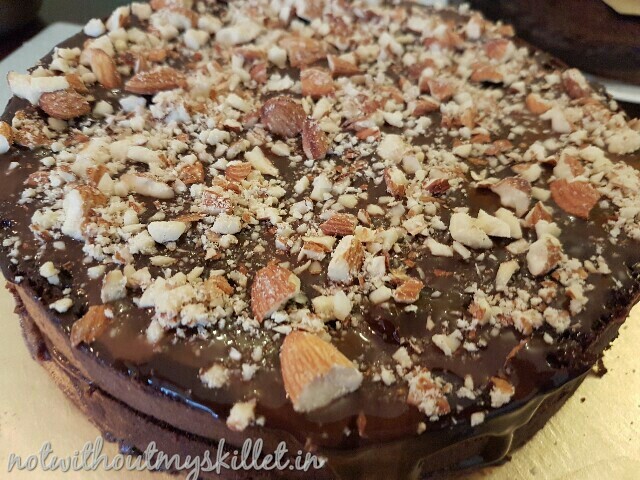 I’m next trying out a sugar-free Barley flour cake with orange, sugar-free chocolate and almonds…:) will let you know how that goes! 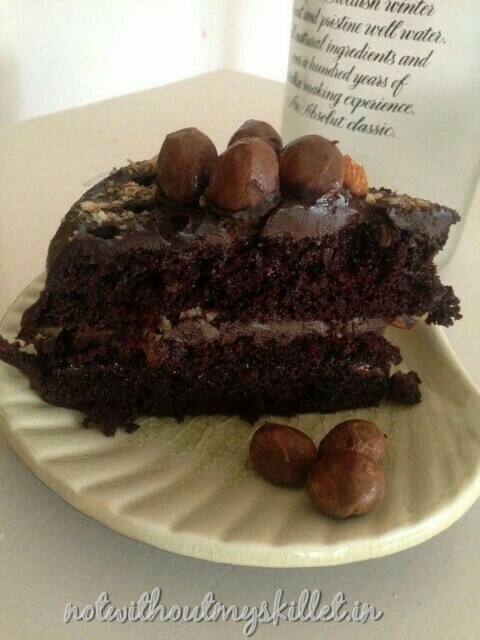 I garnished the cake with some Nutties to add some more crunch to the cake! 1. Pre-heat the oven to 200 degree C. Butter 1 8-inch round cake pan and dust it with flour. Tap of the excess. Set aside. 2. In a medium bowl cream the butter till it changes colour. Add the powdered sugar and cream further. 3. Separate the eggs. Beat the whites till absolutely fluffy. Beat the yellows with vanilla, then add the buttermilk, mix and set aside. 4. Add the yellow and buttermilk mix to the butter and sugar mix and mix again. 5. Now sift in the flour, baking powder, baking soda and chocolate powder together and mix it into the buttermilk, sugar and egg mix without over beating it. 6. With the help of a wooden spoon add the egg white slowly. Using the ‘4’ shape movement to mix the egg white fluff into the chocolate mix. Do this really carefully as you need to make sure you don’t lose air from the egg whites. 8. Cool the cake and slit it horizontally into 3 slices. 9. To make the chocolate ganache, heat the cream and pour it over the chocolate pieces. Mix it well till the chocolate melts and is glossy. 9. Bring the Nutella to room temperature. 10. Divide the vodka into 3 parts to drizzle it over the 3 sections of the cake. 11. Place the bottom layer of the cake on a serving dish. Pour 1/3 of the vodka all over it. Once the vodka is absorbed, place 1 part of the chocolate ganache over it and spread it all across. Top it with 1/3 the crushed almonds. 12. Top this layer with the second layer of the cake. Pour 1/3 of the vodka all over it. Once the vodka is absorbed add the Nutella over it and spread it all across. 13 Place the topmost cake layer over this now. Use a toothpick to make holes on it and then pour the vodka all over it. 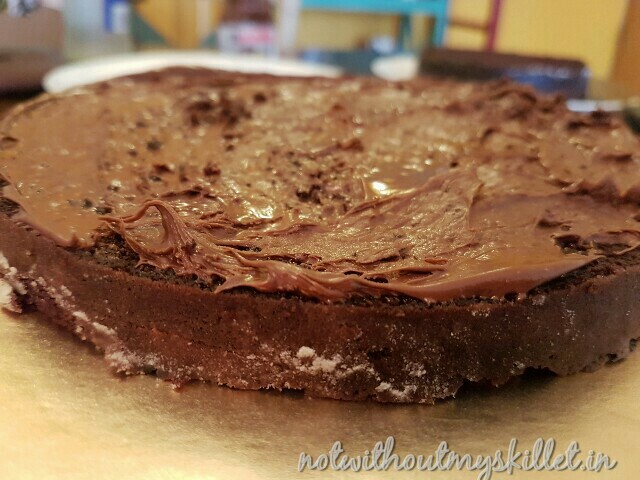 Now pour the left over chocolate ganache all over and spread it on the sides too. 14. 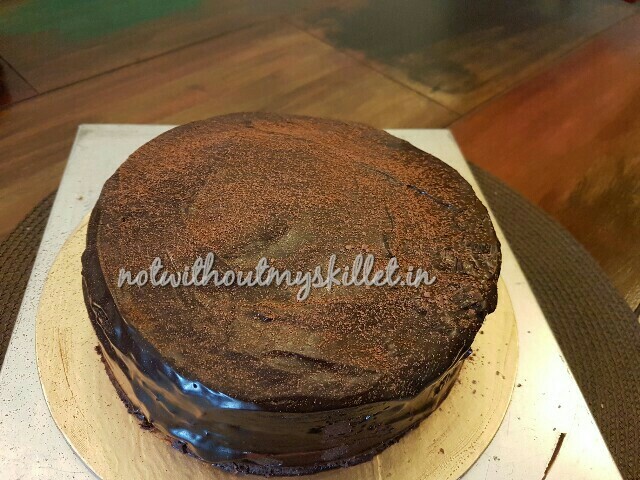 Sprinkle a teaspoon of Hershey’s cocoa all over the cake. 15. 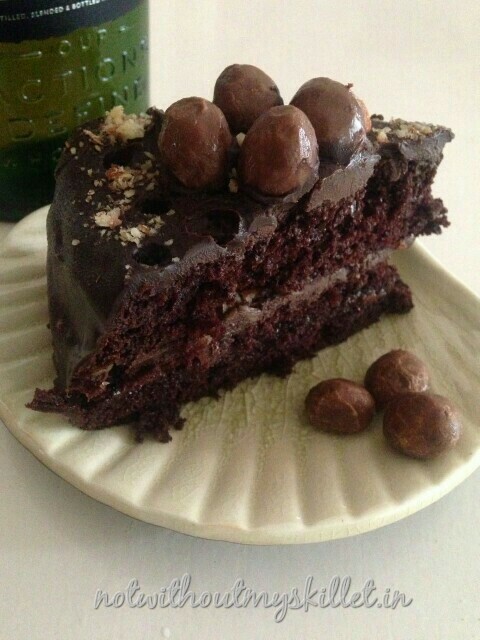 Place the Cadbury’s Nutties in one corner and scatter the crushed almond all over the cake. 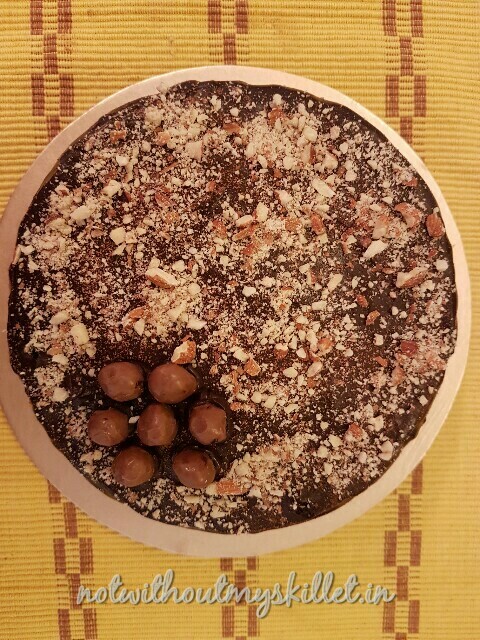 Your Chocolate Martini Cake it ready to be devoured! You could flambe this cake with some more vodka or chocolate liqueur too!